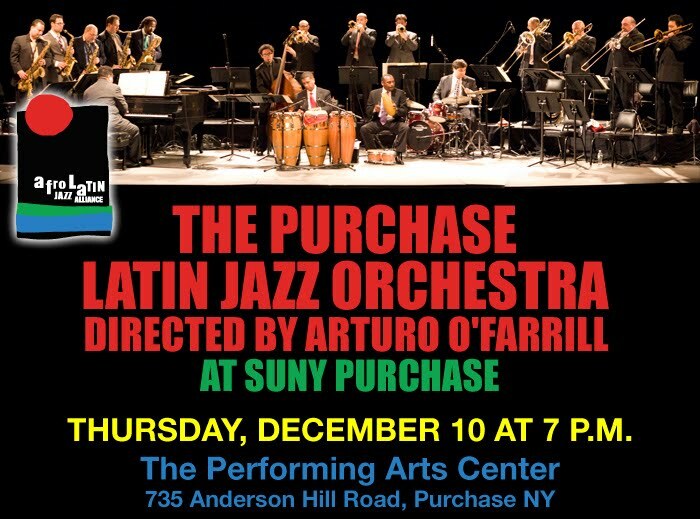 Afro Latin Jazz Alliance: Arturo at SUNY Purchase, Tuesday, Dec 10 at 7 p.m.
Arturo at SUNY Purchase, Tuesday, Dec 10 at 7 p.m.
Three compositions by Ray Santos: "Cookin'" "Cochise" and "Sunny Ray"
This evening's performers are students from the renowned Purchase College School of the Arts Conservatory of Music — known for its intensive training for aspiring performers and its academic excellence. 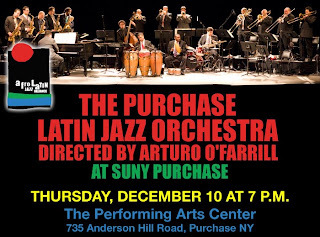 Composer Arturo'O'Farrill won a Grammy Award for Best Latin Jazz Album for "Song for Chico." He performs at leading clubs and concert halls and created the Afro-Latin Jazz Orchestra for Jazz at Lincoln Center.